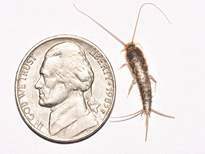 Silverfish can live in envelopes and will eat clothing and do damage to papers, etc if left unchecked. They are usually found in stored boxes. You can purchase silverfish baits online, and if they are fresh, they can be effective. We recommend buying a roach powder (99% orthoboric acid, 1% inert ingredients) and dusting boxes that have papers, etc in them (available at Home Depot, etc). If you have papers stored in your attic, they can easily be there. You will find them in the bathroom as they are looking for water. You can dust your bookshelves also, as they will damage books. They are a pest that is best handled by eliminating their habitat.